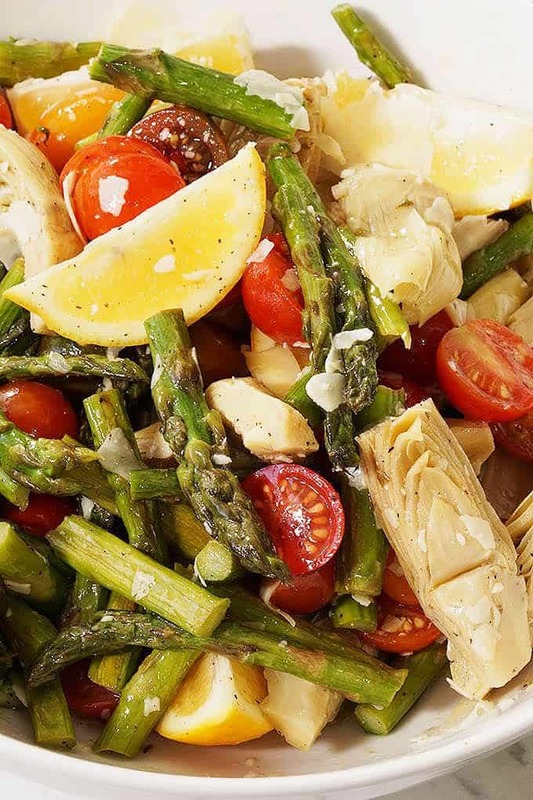 Ditch the winter blues with an Asparagus and Cherry Tomato Salad. 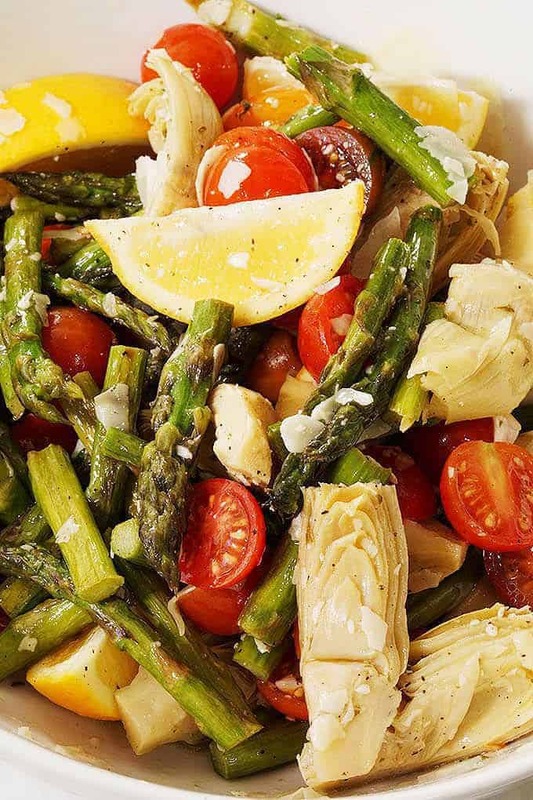 Made with roasted asparagus, fresh lemons, cherry tomatoes and marinated artichokes hearts. This salad is topped off with a light, bright and easy homemade lemon vinaigrette. Thank you so much for the opportunity to share a recipe with your audience Jenny! Though we’ve never met, blogging has brought us together. When I heard Jenny would be recovering after surgery I offered to guest post. I’m hoping this will give her an opportunity to rest and recover! Sending best wishes and healing thoughts your way Jenny! Hi! My name is Deb and I blog at Bowl Me Over. On my blog I share delicious recipes that often end up in a bowl (hence the name Bowl Me Over! ????) 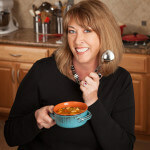 I love to cook soups and stews like Potato Soup or or Zuppa Toscana – big delicious meals that are full of big flavor! I also share delicious salads and yummy comfort food. Most of the meals I share are perfect for busy families and easy to make on a weeknight as they are quick and delicious! 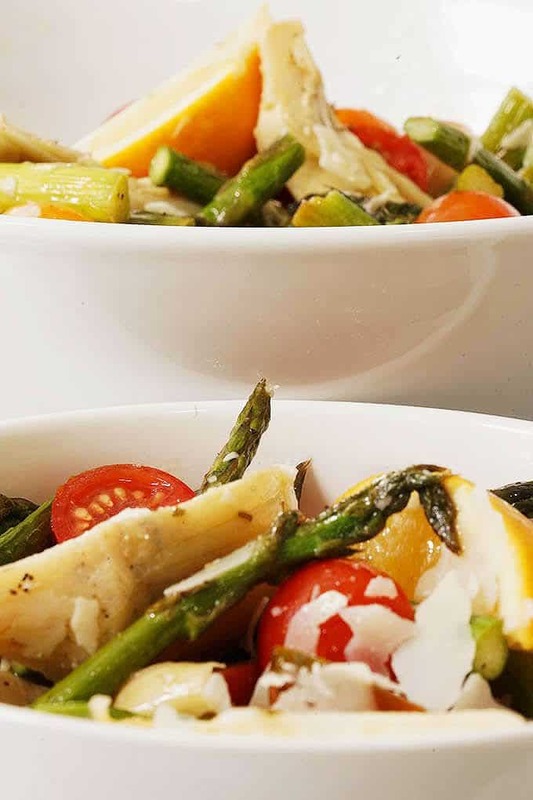 What I’d like to share with you today is an easy salad – Asparagus and Cherry Tomato Salad. It’s quick to make with roasted asparagus, tomatoes and artichokes. 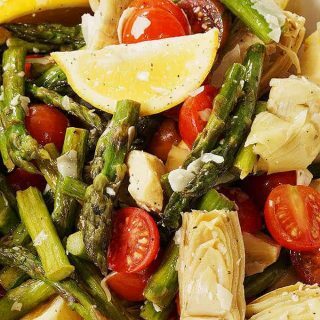 Dressed with a flavorful and easy lemon vinaigrette, it’s fresh and delicious! I live in Fresno California. The fertile central valley in California boasts amazing produce and right now citrus is in season! Nature’s Bounty! These are meyer lemons harvested from my Mom-in-Law’s tree. They are so sweet it’s amazing. Because citrus is in season, I know you’ll find some great citrus at your store also! Not only is this salad incredibly fresh and delicious, with only a handful of ingredients it’s super easy too! I pride myself in sharing tried and true side dishes, many that have been passed down from generation to generation. My grocery store has a great deli department with bowls full of delicious salads. They offered a similar salad and I thought it would be a great recipe to develope. I think you are going to love this as much as I do. This salad is best served at room temperatures. 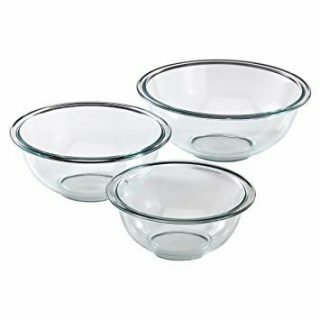 Refrigerate leftovers and before serving remove from the fridge and bring to room temperature. Microwave or heat the honey to make it easy to drizzle. It will be easier to emulsify when whisky into the vinaigrette. Leftovers top off grilled chicken or pork deliciously! Do you love this meal? Be sure to leave a comment to let me know! And if you enjoy this recipe, please join me at Bowl Me Over. I’m giving away a mini cookbook that’s yours free for signing up for my yummy recipes! 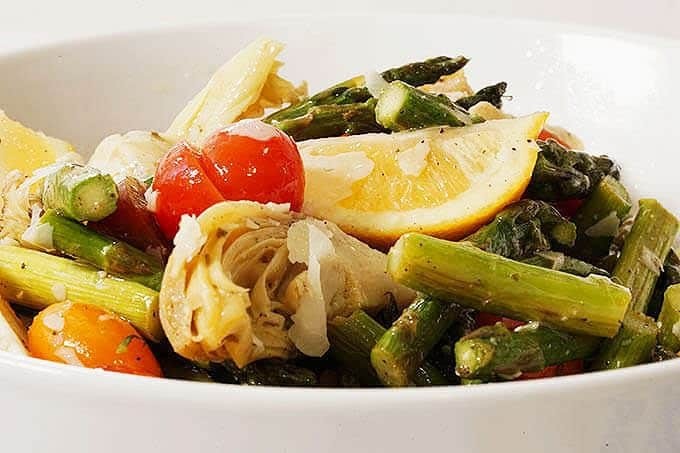 Asparagus and Cherry Tomato Salad - Roasted asparagus, fresh lemons, sweet cherry tomatoes and marinated artichokes hearts are topped off with a light, bright and easy lemon vinaigrette. Mix the vinaigrette. Drizzle over about half over salad and toss well to mix the ingredients. Refrigerate remaining vinaigrette for another use. 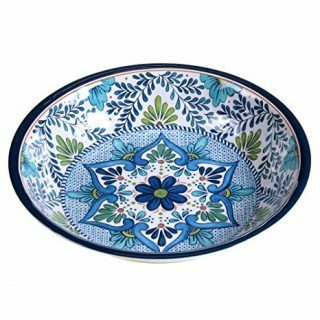 Debra Clark blogs at Bowl Me Over where she shares her love of all things in a bowl! Soups, stews, salads, Buddha bowls, ice cream you name it! All are delicious and full of flavor. Most are quick, easy and healthy too! Looks awesome, I love all the fresh ingredients! 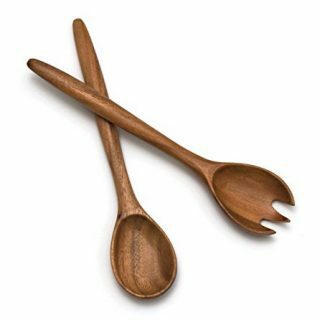 Just perfect for my office lunch ! Thank you so much !